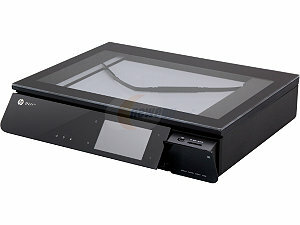 To wirelessly print from any location: The HP Envy 120 Color / All-In-One Color Printer has a sleek design, is quiet, can print, copy, scan, and access the web, has a USB port optimized to power smartphones and can scan and send straight to your email account. With the HP ePrint – I can print from anywhere by sending documents to my printer’s unique email address. This means I can develop my ideas on the road, send them to my printer, and have them waiting for me when I come home. To wirelessly stream your music: I believe that every big or small innovator can benefit from listening to music. When I am working on projects or our kids are doing their homework we stream music to put us in the mood to create new ideas. 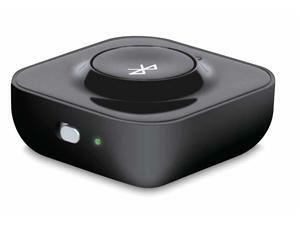 To enable mobile music streaming, I am going to use the i.Sound GoSync Portable Stereo Bluetooth V2.0 Bluetooth Receiver. The iSound GoSync can wirelessly broadcast music from smartphones, tablets, MP3 players, computers and more to your home or car stereo, control playlists, includes a built-in rechargeable li-ion battery, remembers up to 6 devices and has a 33 foot wireless range. Wireless accessories: When I am working on my laptop I like to carry a wireless mouse with me for comfort and ergonomics. I am also inspired by artistic design. 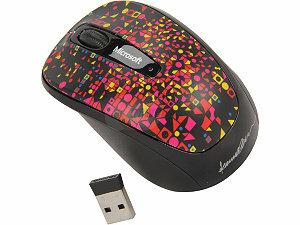 The Microsoft Wireless Mobile Mouse 3500 Artist Cheuk 4 is not only comfortable but has original artwork on it created by Deanne Cheuk, a New York-based art director, illustrator and artist. 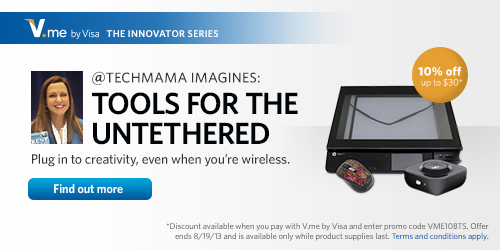 What wireless products do you need when creativity strikes? Disclosure: This is a sponsored post. I received $500 from Visa to buy my products on Newegg.com and used its V.me online payment service (available on the Newegg checkout). All of my words are my own. 1. Sign up for V.me by Visa at https://www.v.me/ to store one or more of payment cards (including Visa, MasterCard, American Express, and Discover cards ) and shipping addresses in your V.me account. A default card can be set or changed as needed. 2. At participating websites there will be a checkout with V.me by Visa button. This button enables paying at the online checkout by signing in with the V.me by Visa account (email address and password), confirming payment details and then clicking pay. 3. Payment information is stored behind multiple layers of security. Customized email or text message alerts can provide notification about purchase activity.